While I am working on the fourth volume and editing the third volume, I have also started two of my planned prequels. One prequel will revolve around the origins of Vogan, the main villain of the whole series. In addition to exploring Vogan’s origins, the dawn of the neohuman race will also be elaborated. The other prequel will revolve around the origins of the female lead and last of the high elves, Tinisha Dolaira. Also, this particular prequel will show what kind of sword and sorcery world Tinisha came from before it was destroyed and she crossed over into 21st century Earth. I have been planning these prequels for some time and am glad that I am finally getting started on them. I will keep you posted on any further developments. A few days ago, I filled out an application that would allow me to have my own booth for a book signing at WonderCon next year. I will wait and see if they will accept me and keep you all updated. If they do accept me, if any of you are planning to go to WonderCon next year, feel free to find me. I will inform you of any further developments. Wish me luck! For as long as I can remember, dragons have always been my number one favorite mythological creature. I have always admired their size, strength, and unrivaled majesty. In various fantasy stories, dragons shared a number of traits, such as being able to overpower entire armies or incinerate entire kingdoms. With such unmatchable power at their disposal, I strongly believe that dragons are living weapons of mass destruction. I love dragons so much that I decided the main character of my series, Patrick Donovan, would have the ability to generate and manipulate dragon fire. In addition, I also made Patrick think like a dragon with a personality that operates like a backdraft, normally calm and serene, but when properly provoked, the results are explosive like a backdraft being exposed to oxygen. Also, a dragon makes an appearance in the second volume, but it is not like the rest of its species. As the series progresses, Patrick will gradually become more dragon-like. To unleash my imagination and share it with the rest of the world. 2. What’s your favorite book at the moment and why? Eragon because it was one of the very first stories to get me interested in the fantasy genre and allowed me to fall in love with the high elf race. In addition, its author, Christopher Paolini was one of the authors who inspired me to begin writing in the first place. 3. How often do you read? A few times every couple days. One-Winged Angel from Final Fantasy VII: Advent Children (Orchestra Version). 5. If you could choose any literary character to relate to, who would it be? Harry Potter because I also had humble beginnings and ended up becoming something greater. 6. Do you do any other art form (ex: paint, sing, sculpt)? I have very basic drawing skills, but beyond that I have no other artistic forms. Game of Thrones because it was a fantasy show that truly demonstrated to me how morally ambiguous characters can be. Young Frankenstein, which I can reenact word for word. To help spread the word of my books, help people find them, and allow my audience to get a better understanding of me as both a person with autism and as a published author. 10. What are your goals for the next year? I plan on getting my upcoming third volume of my series published, continue with my fourth volume, and begin a number of my planned spin-off origin short stories. I also intend to continue working with manga artists so that I can one day convert my books into manga graphic novels. Finally, I hope to find another opportunity to speak on behalf of autism awareness organizations with the intention of spreading the word of the potential benefits one can gain from being autistic. 11. Which do you read more with, E-reader or print books? I think I have a healthy balance between the two. 1.) Do you enjoy anime and manga? 2.) What is your favorite pet? 3.) What country would you want to visit the most? 4.) What would you describe as your favorite vacation experience? 5.) If you enjoy superheroes, who is your favorite one? 6.) What is your opinion of pit bulls? 7.) What kind of music do you enjoy? 8.) What makes you laugh the most? 9.) What is your favorite season of the year? 10.) How would you describe as the perfect villain? 11.) What is your favorite dessert? I donated copies of my books to the Katie Wheeler Library in Orange County. In addition, I have been monitoring their check-out history and found out that they have been checked out a number of times already. I will keep you updated on any further developments. Wish me luck. I received a pleasant surprise from the manga studio instructor I am working with. 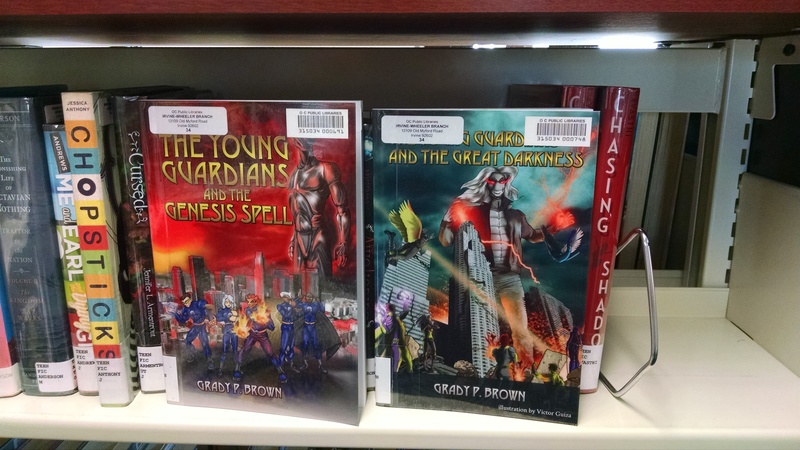 He read both of my books recently and wrote the following five star review for each of them: “Fascinating story and great for graphical novel production.” I am pleased that he enjoyed my work and I look forward to seeing where this will lead. Wish me luck.